The giant Three Gorges Dam across China's Yangtze River has been mired in controversy ever since it was first proposed 88 years ago by Sun Yat Sen, the founding father of Modern China. In 1992, when Chinese Premier Li Peng submitted a proposal for the dam to China's normally pliant parliament, the National People's Congress, it ran into serious opposition and ultimately passed with the smallest margin in the legislature's history. Still, it is a sign of just how grave the problems are facing the world's largest dam that criticism is now coming from top government officials in Beijing, who previously had studiously avoided saying anything derogatory about the $180 billion project. In June, Chinese Premier Wen Jiabao told a meeting of the State Council, convened to discuss the Three Gorges project, that solving environmental problems surrounding the controversial dam project should be a priority for the country. On Sept. 25, a group of senior government officials and scholars announced at a work meeting in Wuhan that the project had the potential to cause a "huge disaster ... if steps are not taken promptly." And on Oct. 9, the Chongqing municipal government announced it would have to relocate an additional four million people in at-risk areas due to environmental damange caused by the dam. 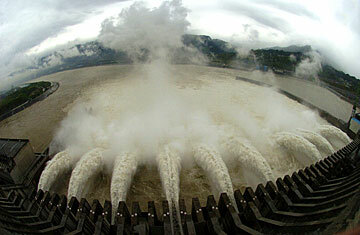 Originally built to control the Yangtze's regular flooding, produce electricity to fuel China's booming economy and (not incidentally) serve as a symbol of the nation's emerging engineering prowess, the Three Gorges Dam has already faced a host of problems. An estimated 1.4 million residents have been displaced by the 640-km-long reservoir forming behind it, which also flooded several important archaeological sites. And some hydrologists say that by trapping silt the dam could actually make downstream riverbanks more vulnerable to flooding. Now, however, scientists say things are getting worse. The water quality of the Yangtze's tributaries is deteriorating rapidly, as the dammed river is less able to disperse pollutants effectively. The incidence of algae blooms has risen steadily since the reservoir was completed in 2006. The rising water is also causing rampant soil erosion, resulting in riverbank collapses and landslides along the shores of the Yangtze's tributaries. Professor Lei Hengshun, an environmentalist at Chongqing University who has devoted years to studying and preserving the Three Gorges ecosystem, says that if the water level of the reservoir reaches its planned height of 165 meters next year, it will bring tributaries of the Yangtze River under even greater environmental threat. "Now it's a good time to review the problems that have arisen," he says, "before a larger flooded area brings an even bigger impact on the tributaries." The dam's environmental troubles go hand in hand with growing political issues. Li Peng, the dam's most ardent supporter, stepped down as Premier in 1998 and has little influence among China's current leadership. The recent storm of criticism the dam has garnered could be a result of political jockeying in the run-up to next week's Communist Party Congress, a five-yearly event in which the coming reshuffles of the Party's senior ranks are usually decided. But it's also possible that the criticism is a sign that the Chinese government has reached the point at which it must do something to address the country's serious  and growing  ecological concerns. It's been a turbulent year for China's environment. In May, a blue algae outbreak on picturesque Lake Tai in Wuxi city rendered tap water for 80% of the local families undrinkable for a week. In June, 10,000 citizens in the coastal city of Xiamen took to the streets to protest against the imminent construction of a new chemical plant. Pan Yue, Deputy Director of the State Environmental Protection Administration, said earlier this year that "environmental problems are posing a serious threat to the building of a harmonious society, and have become a significant economic, social and political issue." At this point, it's highly unlikely that work will stop on the gigantic project; the dam is still on track to be completed by 2009. But with the current administration apparently at pains to seem more environmentally sensitive, it's possible that its worst effects can be dealt with. Lei, for one, thinks the government's new willingness to talk about the dam's problems means Beijing is trying hard to make the right call. "No one can guarantee the Three Gorges will be catastrophe-free," says Lei. But the chances are much greater that a catastrophe can be avoided "as long as the government is able to deal honestly with the situation."